Perhaps the 2nd best ride of the trip. Vermont rules for riding. Day 48 didn’t start out much different than many of our other days. However, it wasn’t long after we started that we entered Vermont on Route 9. What I am about to say sounds pretty prejudiced, but so far our experience riding in Vermont has been dramatically nicer than NY and perhaps any other state we’ve visited. Here are a few reasons why… 1) less traffic maybe, 2) Great scenery, 3) Great Terrain, 4) More courteous treatment from drivers, 5) Better berms (5-10’ wide in places with no debris for tire damage). 6) My first extended ride with the Heritages was in Vermont and was a wonderful experience…BAckroads “Otter Valley Wonderer” for a week. 7) My son in law and his family are from Vermont, 8) Our wonderful mechanic Jim Benson is from Vermont. Take my word for it, this is a great place to road bike. The profile of today's ride. The elevation scale is 0 to 2,400 feet. We climbed a total of 5,180 today. Tomorrow we have 5,800 scheduled and some optional stuff we might do. After that a day on parade and we are finished! Most of the ride was a version of this. I wish I could make this stuff happen. Wow, another perfect riding day. Foggy, cool, humid morning. The sun burns the fog off by 9:30 or so. The hills mask a lot of the wind, but the wind we could feel was at our backs out of the south west at 10 mph per the weather channel. No rain. The only way I’ve gotten wet on this ride has been sprinklers, my own sweat (I did literally pour it out of my shoes today) and the spray from Niagara Falls. Steeple in Brattleboro hit by lightening and being dismanteled. A perfect day from everything I’ve heard today. No rider incidents to report. Everyone made it in safely. This ought to be illegal to feel this good. I’m not doping, honest. I think for a ride to be euphoric for me, there has to be a challenge to the ride, some nice scenery, curvy roads that involve good climbs and good descents. The hills of Southern Ohio are like that. Mount Rushmore is like that. And what we experienced in Vermont today was like that. Everyone seemed to really love the ride today. There’s really not much to report about the ride except that I hung with Gerard again. We started out probably in the top third of the group. There was a long climb for about 2 miles out of Troy and I we thought we were at the front of the pack by then. Cindy scooted up the hill ahead of us, but we drop like rocks and on the first little descent we caught up with her. She is quite the climber. Little did we know however that Steve Bennett had jumped out of the shoot early today. A few miles from the Vermont border we catch up with him and pass him on an incline. He stays with us for a while and then claims that he just wants to sight see today and doesn’t want to ride with us. When Gerard and I stop for some photo’s at the “Welcome to Vermont” sign guess who blows by with his game face on, peddling for all he’s worth? All three of us end up ahead of the first SAG who is not where they are supposed to be. We just keep riding. At the second SAG stop Jeff is just setting up when Gerard and I arrive. He tells us we are a mile or two ahead of Steve. Both of us are surprised. After we’ve filled our bottles and had some bananas and cookies, here comes Steve. Somehow he fills his bottles and signs in and I don’t think he even got off his bike. Gerard and I look at each other, shrug our shoulders and laugh. Steve gets about five minutes out ahead of us and we never see him again until the hotel. Gerard and I stop for a few more pictures and sight seeing. All in all it was a grand ride and a grand day. Tomorrow even more hills. We may decide to take a side trip to a very long, steep hill that Mike has cut out of the trip because he’s worried that someone will have a heart attack trying to do it. Stay tuned. You have done it! Congratulations! What a feat! You have such varied and delightful memories and beautiful pictures to prove your traveling across the US. Great job. I am back in Ohio and closer to your finish. Don't finish too soon. It is hot and humid here, especially after three weeks in Colorado. I am lookin forward to seeing you soon and hearing about your trip first hand. Of course, I won't be able to ride with you anymore. You are way ahead of me. Congrats! 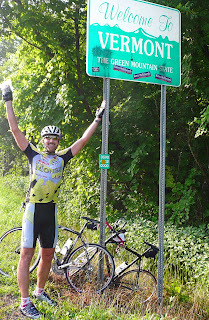 Day 50 - Manchester to Portsmouth NH - THE END!